Rajasthan Animal Husbandry Recruitment 2013 Apply Online Driver Vacancies Opening : 1. 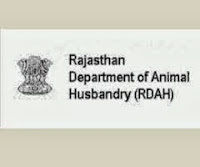 The Government of Rajasthan, to fill up 65 Vacancies for different post in Rajasthan Animal Husbandry organization has released an official recruitment notification 2013. All the candidates who wish to start & grow their career in government sector can apply for this. Go through the below given information for more details. Applicant must have successfully completed their 8th class. Candidate must own a Light Motor Vehicle (LMV) and Heavy Vehicle (HVD) Driving License. Candidate should be in between 18 to 35 years of age as on 01-01-2014. Age relaxation is applied as per Govt rules. All the candidates who are shortlisted will be offered Rs. 5200/- to 20200/- with grade pay Rs, 2400/. Rs. 7900/- per month will be offered to the shortlisted candidates during the training period of two year. Selection of a candidate will be done based on his/her performance in the interview. Candidate mustn't exceed 65 KG and eyesight should be 6X6 with or without spectacles. Rs.300 for General/ OBC and Rs.150/- for SC/ ST must be paid as an application form in the form Demand Draft in favor of Director, Animal Husbandry Department, Rajasthan, and Jaipur. 8. Candidates join us on Facebook for latest news and updates about Rajasthan Animal Husbandry results 2013 . Guys subscribe us for free email alerts and bookmark our page for future updates.